When the name Mustang is mentioned, the first thing that will hit your mind is one of Ford's most famous sports cars branded 'Mustang.' Ainsworth Interactive Gaming developed Mustang Money video slot and released in December 2017. It joins the developer's unique 100 line style collection, in what we believe is the best layout, and it is featured in another video slot like Storming 7s and Dragon Lines. Like other slot games from Ainsworth, Wild Money slot was first played in brick and mortar casinos and has been upgraded with the latest technology for online casino lovers. This superb video slot will take you on a trip to the American Prairies in the West where the wild Mustangs roam freely. On your adventure, you will only see the mustangs but also other wild animals that make the game even more appealing and fun to play. Although the theme has been used before by other well known developers like NextGen Gaming's Wild Cat Canyon slot and IGT's Wolf Run video slot, here, you will only find the Mustang and the Bald Eagle on reels. They blend well with the desert sunset scene from the wild flames. 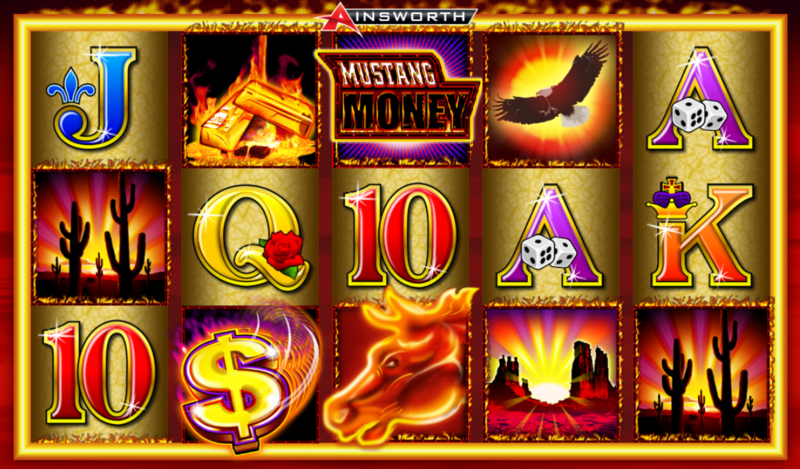 Ainsworth's Mustang Money comes with several symbols and features like the wilds, free spins, and multipliers to increase your chances of building the bankroll. With high volatility, a bet range of between $1.00 up to $75.00 and a theoretical return to player of 94.38%, you can choose to play from your desktop, smartphone or tablets. When you load the Mustang Money slot, the first thing that will get your attention is the magnificent red and orange sunset on which the reels are set. The dull smoky lighting on the screen blends perfectly with the theme and symbols used in the game. The reels are appealing too as they are made of gold while other symbols are all circled by hot flames. At the bottom of the screen lies the control panel and options for increasing or decreasing your pay lines and bet amount. Ainsworth has a number of symbols represented by Mustang Money logo, a bald eagle, fire mustang, burning bullion bars, a canyon, cacti, and the standard playing card symbols represented by letters 9, 10, J, Q, K, and A. The graphics used and the visual animations are perfect and provides a memorable gaming experience. Mustang Money offers the standard five reels and a big 100 win lines that can be adjusted to the player's liking. This allows players with low and big bankrolls to enjoy this game without any worries. The spins can be set starting from $1.00 up to $10000 for all the 100 win lines. Play this thrilling video slot from sunset to sunrise, and huge prizes will reward you. The highest prize you can get in this slot is 1000,000, which is relatively higher than the standard slot games. There are different betting options on the screen, and it is essential to understand the function of each one before you start playing. Lines: Increase or decrease the number of 'LINES' using the plus(+) or minus (-) signs. Bet: Raise or lower your Bet Amount using the adjacent +/- signs. Total Bet: This is the Bet amount multiplied by the number of Lines. Play: Click on 'Spin' or press spacebar on your keyboard to start playing the game. The winning combinations on the selected lines will be paid according to the paytable. Stop: Once you click on the Spin button it automatically becomes the Stop button. Click on Stop or press the Spacebar to stop the reels. Auto: Click on the Auto button and the +/- signs to play a specific number of spins uninterruptedly. The journey to the West cannot be complete without a perk of symbols and unique features to boost your bankroll. Ainsworth understands this quite well, which is why they equipped Mustang Money slot with both low value and high value symbols. The low paying symbols are marked by letters A, K, Q, J, 10 and 10. The Horse represents the wild symbol of the game and it can substitutes for all other symbols except the scatter and the Coin. The Horse can only appear on reels 3, 4 and five during the paid games. The Golden Coin symbol has the power to replace all other icons in the game except the scatter and wild. It can only showcase on reels 2 and 4 and during the Free Games feature. When this symbol appears, you will be rewarded either with a 1x or 2x multiplier. The Mustang Money represents the Scatter symbol of the game and can unlock a non-progressive jackpot of 1,000,000 coins as well as a bunch of free spins. Land three or more scatters and you will be rewarded with ten free spins. 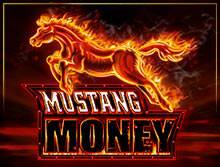 The fire Mustang, Golden Coins and Mustang Money logo will convert to scatters during the free spins play mode. The Fire Mustang can only surface on reels three while your free spins are in use. Three or more MustangMoney scatter symbols will trigger ten free games. The Horse wild symbol will appear on reel three only. Also, the Golde Coin on reel two will replace in any winning combination, and the prize will be randomly be multiplied by x1 or x2. Play Mustang Money on the Go! Imagine enjoying this adventurous video slot from your smartphone or tablet while on a real road trip to see the real Wild Mustangs and other animals in the American Prairies. Yes. Mustang Money slot from Ainsworth gives you the chances to enjoy it from anywhere in the world. The game is available in instant mode only, meaning you dont have to worry about downloading any software or apps on your devices. Play Mustang Money slot directly via standard browsers like Firefox, Chrome, Safari, and Opera and win lucrative prizes. Ainsworth is an Australian based casino games creator established in 1995. Guided by their vision, "to deliver excellence in Global Gaming Solutions," the first started by developing land-based slot machine games. The reason for their small online casino game portfolio is because they ventured the online market in 2013. The company holds two masters licensed from Alderney and the UK, which gives it a broader market than its competitors. Their slot games are available for all players in free play and real money versions and are listed in leading online casinos in the industry. There is no better casino site to enjoy this exciting video slot game than at bCasino. We are merely a year old in the casino industry, yet we offer everything you may want from a casino. Our rich game portfolio is powered by leading software developers such as Evolution Gaming, Pragmatic Play, Yggdrasil, NextGen Gaming, NetEnt, and Microgaming. All activities on our site are monitored and regulated by the UK Gambling Commission. We use the latest 128-bit Secure Socket Layer (SSL) encryption software to protect our customers' online transactions and sensitive information from leaking to hackers. One reason many players flock at bCasino is to enjoy our generous welcome bonus of up to $1200 plus additional free spins. You can access our extensive game library and other exclusive services on your mobile, smartphones and personal computers from anywhere around the world. We cannot forget mentioning our highly trained and friendly customer support agents. Feel free to contact them anytime via email, live chat, and telephone.